Jonathan Sanchez did not have the kind of outing he and the Giants hoped in his return from the disabled list on Friday. Sanchez gave up five runs on seven hits and two walks in 4 2/3 innings in a 9-2 loss Friday to the Phillies. Dating back to his previous two starts before going on the DL on June 25, it was the third consecutive start that Sanchez failed to pitch through the fifth inning. But in some ways, there were signs of encouragement. For one, it was the first time six starts that he didn’t walk at least three batters. However, being in the strike zone was not all good, as the seven hits he gave up tied a season-high — as did the five earned runs. Sanchez sailed through the first three innings, giving up just one hit and one walk and facing just 10 batters. The Phillies went 1 for 8 with a walk and GIDP the first time against Sanchez. The second time through they were 4 for 9 with two singles and two home runs. But even that is a little bit deceiving. Shane Victorino hit a one-out home run on an 0-1 pitch in the fourth. The pitch wasn’t a terrible one, but Victorino saw it and hit it hard. Then Chase Utley and Hunter Pence followed with singles, but Sanchez almost got out of the inning with just the one run. Raul Ibanez grounded to second, but he didn’t hit it hard enough for the Giants to turn an inning-ending double play. A run scored, the John Mayberry hit a 3-2 fastball that was below the strikeout for a two-run home run. Just like that, a one-run inning became a four-run inning. In the fifth, the Phillies added a more Sanchez-like run. It started with a four-pitch leadoff walk to Jimmy Rollins, which turned into a stolen base, which turned into a run on a single by Placido Polanco. So a bad outing that came very close to being a not-so-bad outing. We can hope, if not expect, better results next time against the lighter-hitting Pirates. Well, we can at least say this about the 2011 Giants: They know how to make a 9-2 thumping exciting. The Giants dropped a second straight game to the Phillies on Friday in San Francisco, but the real story was the dust-up in the sixth inning after Giants reliever Ramon Ramirez hit Shane Victorino with a pitch. With the Phillies leading 8-2 with two on and two out in the sixth, Ramirez hit Victorino square in the back with his first pitch. Victorino took a couple of steps toward the mound, but stopped. Giants catcher Eli Whiteside popped up to put himself between Victorino and Ramirez, who was walking toward Victorino after tossing aside his glove. The situation seemed about ready to cool down, but after Whiteside put himself between Victorino and Ramirez, he was hopping around like Cassius Clay vs. Sonny Liston, his head on a swivel, looking for any Phillie who might come at Ramirez. When Placido Polanco, who was on first base, got within a 10-foot radius of Ramirez, Whiteside tackled him, and the scrum was on. There was some pushing and shoving, but nothing too serious, until Victorino, who was being held away from the scrum, got away and dove back into the pile. Ramirez, Whiteside and Victorino were all ejected. But the big question is: Why was Ramirez throwing at Victorino? “I called for a fast ball inside, and it was a little too far inside,” Whiteside said. Well, actually, it got a lot inside. “I have no comment on the fight. … I played a little quarterback in high school,” Whiteside added. Apparently, he wasn’t a very good quarterback, because his tackling form was textbook perfect. Victorino thought he was being thrown at. That’s why he stepped toward Ramirez, to get an answer as to why. Well, here are some possible explanations. THE STOLEN BASE: Ah, yes, those unspoken rules. After Jimmy Rollins scored two with a two-out single, making it 8-2, the Phillies shortstop stolen second on Ramirez’s first pitch to Polanco. If Ramirez was upset about this, he didn’t show it. He paid no attention to Rollins at first (maybe because it was 8-2), and Rollins stole second without a throw. And if the Giants were upset, at what point did they get upset? Ramirez threw five more pitches to Polanco before he reached on a swinging bunt. Then came the pitch to Victorino. Carlos Beltran insinuated that Rollins’ breach of etiquette could have been a contributing factor. “I would not have done it,” Beltran said of the stolen base with a six-run lead. Of course, who was the last Giant to join the scrum? Carlos Beltran. FRUSTRATION: Phillies manager Charlie Manuel said frustration by Ramirez led to the confrontation. “I think he was getting hit and he got mad and he was going to plunk somebody,” Manuel said. Maybe a better explanation. It was a frustrating inning for Ramirez. After getting the first out, he walked Raul Ibanez and gave up a single to John Mayberry. That was followed by an RBI single by catcher Brian Schneider, who was hitting .170. Pitcher Vance Worley was out on a nice catch by Whiteside on a bunt attempt. But then Ramirez helped the Phillies by throwing a wild pitch. Then came Rollins’ single and it was suddenly a three-run inning. UTLEY FACTOR: It also could be the Ramirez wanted to throw at Chase Utley, who was a central figure in the scrum at last season’s NLCS. Utley normally bats third in the lineup. But Friday, with Ryan Howard sitting out, Utley was batting cleanup and Victorino was batting third. So maybe Ramirez just got confused. It’s as good a reason as any. Regardless of the reason, it provided a little drama to a blowout at AT&T Park. After the Giants score eight runs in a game at home for the first time all season on Wednesday, Orlando Cabrera expressed a sentiment that Giants fans have experienced all season long. Don’t tell that to Cliff Lee. The left-handed pitcher the Giants handled so well in the World Series shut out the Giants Thursday night as the Phillies won the opener of a four-game series 3-0. For Lee vs. the Giants, maybe it’s a regular season/postseason thing. Lee entered Thursday’s game 3-0 with a 1.31 ERA in three regular-season starts with the Indians and Phillies against the Giants. In the postseason, he’s 0-2 with 6.94 ERA vs. San Francisco. If you wanted to take some good news from Thursday, it’s that Madison Bumgarner worked his way out a recent funk. After another one of “those” first innings in his last start in Cincinnati, Bumgarner got off to a rough start Thursday against the Phillies. He escaped the first thanks to a couple of breaks — a caught stealing of Jimmy Rollins at third (those replays showed him safe) and a line drive double play off the bat of Ryan Howard. MadBum led off the second by allowing back-to-back homers to Hunter Pence and John Mayberry. With the way Lee was pitching that was plenty for the Phillies. Even so, Bumgarner regrouped and finished with six scoreless innings and a quality start. Carlos Beltran went 1 for 4 Thursday with his 31st double of the year and first with the Giants. After beginning his Giants tenure 1 for 14 with six strikeouts, Beltran has hit in his last five games with San Francisco, going 8 for 20 with a double, two triples and no strikeouts in that stretch. For what it’s worth, Zach Wheeler, the pitching prospect dealt in the Beltran deal, made his debut for Class A St. Lucie Mets on Monday. He pitched four innings, giving up four earned runs on seven hits. He had four strikeouts and no walks. Cody Ross went 0 for 4 with four strikeouts against Lee. Pitcher Alex Hinshaw was designated for assignment to make room for Mark DeRosa on the 40-man roster. DeRosa was activated from the 60-day DL, but did not appear in Thursday’s game. Vance Worley, who through a complete game in a 7-2 win over the Giants on July 26, gets the start Friday against Jonathan Sanchez. Sanchez is making his first start since coming off the DL with biceps tendinitis. Sanchez was 1-0 with a 3.27 ERA (4 ER in 11 IP), 13 strikeouts and five walks in two rehab starts for Triple-A Fresno. The Giants won Game 6 of the National League Championship Series the way they’ve won games all season … by the slimmest of margins and with contributions up and down the lineup. So let’s take time to salute all those who made key contributions to the Giants’ clinching victory. Andres Torres: Torres, who struggled so much in the NLDS and early in the NLCS, went 3 for 5. He also played Ryan Howard’s double off the wall in left center perfectly, preventing Jimmy Rollins from scoring from first in the sixth inning. Freddy Sanchez: Sanchez went 3 for 4 with a double. He also sacrificed runners to second and third in the third inning, setting up the Giants’ first run. Aubrey Huff: Huff singled home the Giants’ first run in the third inning, then alertly went to second when Torres was thrown out at the plate. 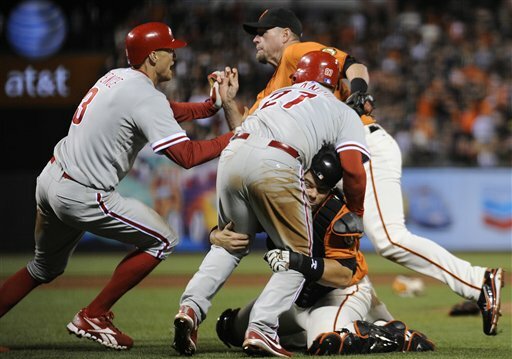 That allowed Huff to score the tying run when Buster Posey reached on Ryan Howard’s fielding error. Cody Ross: Ross was 1 for 4 with a double in Game 6. But we had to mention him because he was the NLCS MVP. Jonathan Sanchez: Sanchez?!? What?!? Yes, we know he couldn’t find the strike zone, throwing 27 balls and 24 strikes in two-plus innings. But it was Sanchez who singled in the third to start the Giants’ two-run rally. Also, Sanchez helped start a mini-melee in the bottom of the third after hitting Chase Utley with a pitch. After being hit by the pitch, Utley picked up the bouncing ball and flipped it toward Sanchez as he ran to first base. Sanchez didn’t appreciate the act, and offered Utley a suggestion. Utley then stepped toward Sanchez, asking him to clarify his remarks. So Sanchez offered him the suggestion again, and Utley waved him off. But it was enough to empty the dugouts and bullpens. Well, not completely. Jeremy Affeldt remained in the pen, and the couple of minutes of aggressive loitering on the field allowed Affeldt time to get properly warmed up. Jeremy Affeldt: Affeldt came into the game with two on and no one out in the third, then struck out Ryan Howard, got Jayson Werth to fly to center and Shane Victorino to ground out, ending the threat. He set the side down in order in the fourth. Madison Bumgarner: The rookie came in and pitched two scoreless innings, pitching out of trouble in both innings when allowed the potential go-ahead run to get into scoring position. 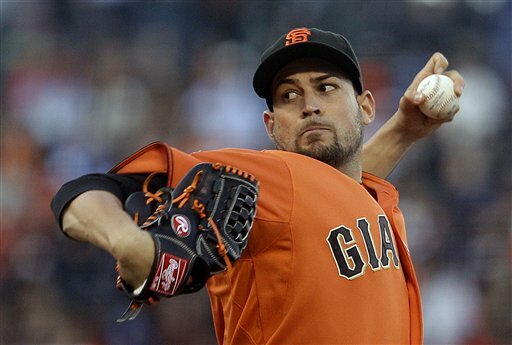 Javier Lopez: When the Giants acquired Lopez from the Pirates, I’ll admit I was puzzled. I couldn’t figure out why the Giants got him. Yes, at the time, both Affeldt and Dan Runzler were injured, so the Giants needed a lefty reliever. But I thought both players would return soon enough, and giving him Joe Martinez and John Bowker was a steep price for a short-term pickup. Well, Lopez has been golden for the Giants, particularly in the postseason. He threw a perfect seventh inning to keep the game tied 2-2. Juan Uribe: How many clutch home runs has Juan Uribe produced this year for the Giants? His ninth-inning blast of Heath Bell to tie the game in April in San Diego. His two-run homer off Roy Oswalt to help beat the Astros 2-1 in May. His two-run homer off Jonathan Broxton in the ninth to beat the Dodgers 5-4 in September. He had two huge at-bats in the NLCS, bringing home the winning run with a sac fly in Game 4. And then he did it again, with a home run to the short porch in right in the eighth inning. Let’s all say it together: UUUUUUUUU-RIBE! Brian Wilson: Yes, he supplied all Giants fans with another case of the “Willies.” Every time Bruce Bochy bring Brian Wilson in for a 4+ out save, it makes me nervous. Wilson does a good enough job of creating his own messes that he sometimes struggled when dealing with someone else’s mess (Game 2 of the NLDS). So when Lincecum gave up back-to-back singles in the eighth, in came Wilson. But he delivered, getting Carlos Ruiz to line into an inning-ending double play. Then came the ninth. You knew it wasn’t going to be a 1-2-3 inning. He got Ross Gload to ground to second, but then walked Jimmy Rollins. He got Placido Polanco to ground into a force play — a key play because it got the faster Rollins off the base paths — but then he walked Chase Utley. Then he pushed Ryan Howard to a three-ball count. It seemed every time Wilson wanted to throw a high fastball away, the pitch would sail way up and away, making for an easy take. When Howard fouled off a 3-2 fastball at the hands, my thought wandered back to an April game in San Francisco when Wilson walked Howard with two-out in the ninth to load the bases, then gave up a three-run double to Jayson Werth. But then Wilson came back with that cutter at the knees and the celebration was on. Charlie Manuel went to his slated Game 6 starter to pitch the ninth inning Wednesday. And what the Giants couldn’t do in Game 2 Sunday, they were able to do Wednesday — figure out Oswalt. Four batters face Oswalt. All four had good at-bats against him. Freddy Sanchez started out the ninth by working seven pitches out of Oswalt before hitting a laser to right. But it was caught by Jayson Werth for the first out. Aubrey Huff jumped on Oswalt’s first pitch by shooting a single to right under the glove of the diving Ryan Howard. Buster Posey battled Oswalt, nearly missing a double down the right field line, before delivering a single to right, that pushed Huff to third. Juan Uribe then delivered the fly ball to deep right, allowing Huff to score the winning run. PULLING OUT ALL STOPS: In addition to bringing Oswalt out to pitch the ninth, Phillies manager Charlie Manuel also let his set-up man, Ryan Madson throw 32 pitches in working 1 2/3 innings. The theory works two ways. Manuel needed Madson to hold the Giants in check, which he did. And Manuel figured he wouldn’t need a set-up man Thursday with Roy Halladay pitching. Halladay is going to go deep into Game 5, regardless of what the Giants are able to do off him. PAINS OF OCTOBER: It’s late in the season, so everyone is hurting after a long season. But the Giants have their fair share of bumps and bruises: SS Edgar Renteria is playing with a torn bicep; SS Juan Uribe didn’t start Wednesday with a sore wrist; 1B Aubrey Huff is battling a sore leg; OF Cody Ross, at the very least, has a nasty bruise after being hit by Joe Blanton Wednesday. STRIKING FIRST: The team scoring the first run has won all five games in the series. NOT SO BIG THREE: With Wednesday’s Game 4 win off Oswalt, the Giants have won three games in the series. The losing pitchers in those three games: Roy Halladay, Cole Hamels and Roy Oswalt. GAME 5 SUCCESS: As the Giants go for the clinching win Thursday, they take a six-game winning streak in postseason Game 5s. The Giants haven’t lost a Game 5 since the 1962 World Series, winning Game 5 in the 1987 NLCS vs. Cardinals, 1989 NLCS vs. Cubs, 2002 NLDS vs. Braves, 2002 NLCS vs. Cardinals and 2002 World Series vs. Angels. Five of those six wins have come at home. For the first time in eight years, the Giants find themselves one win away from the World Series after they pushed across a run in the ninth to beat the Phillies 6-5 in Game 4 of the NL Championship Series on Wednesday. There were many heroes in Wednesday’s win. Sure, Aubrey Huff and Buster Posey were a combined 7 for 10 — which was huge — but this victory has many contributors. Aaron Rowand: Rowand found himself back in the starting lineup for the struggling Andres Torres. Rowand didn’t do much with the bat, going 0 for 2. But he did come up with a huge defensive play, making a perfect throw home to get Carlos Ruiz trying to score from second on Shane Victorino’s single. It came in the middle of the Phillies’ four-run fifth inning. If not for Rowand’s play, it would have been a five-run inning … or worse. Pablo Sandoval: Another former everyday starter who has found himself on the bench lately. But Sandoval came up with a key two-run double in the sixth. Sandoval thought he had that two-run double earlier in the at-bat when pulled a ball down the right-field line. But the ball was ruled foul. Replays were inconclusive. The Panda came back to battle through the lineup, then delivered a liner to the wall in right-center, giving the Giants a 5-4 lead. Freddy Sanchez: The numbers may not show it, but Sanchez is starting to look better at the plate. Sanchez got a first-inning single — the Giants’ first first-inning hit since Game 3 of the NLDS — to get things started Wednesday. Sanchez went to second, and then to third, when Joe Blanton thought he was a cricket bowler and started bouncing every offering to the plate. He then scored on Buster Posey’s single. Cody Ross: Yeah, that guy, again. Cole Hamels joked Tuesday that the best way to stop Ross would be to hit him. That’s what Blanton did in the first, although not intentional. There was some concern, as Ross was clearly stung by the pitch. But he bounced back and had a big double in the sixth that set the table for Sandoval. Aubrey Huff: Huff had three singles in five at-bats, all of them were huge. He singled and scored on Posey’s double to left in the third inning for a 2-0 Giants lead. He singled home Andres Torres from second in the fifth after the Phillies had scored four in the top of the fifth. And he got the ninth-inning rally started with a one-out single under the glove of Ryan Howard. Buster Posey: We’ve been waiting for Posey to get started in the NLCS. Frankly, he’s looked more like a rookie at the plate this series than the poised player we’ve grown accustomed to this season. But the rookie pulled it together Wednesday. He singled home Sanchez in the first inning and doubled home Huff in the third. He had a double to right in the seventh, then a huge single to right in the ninth, that put Huff on third. And he made a nice short-hop grab of Rowand’s throw to the plate and tagged out Carlos Ruiz in the fourth. Juan Uribe: Uribe was unable to start because of sore wrist he injured in Game 1. But he came in late and made two huge plays. First came in the field, when he threw out Ross Gload with a strong throw from deep in the hole in the top of the ninth. And then came his game-winning sacrifice fly, when got the ball in the air — instead of striking out; instead of grounding into a double-play, as we’ve so many Giants do this year — when he needed to. A great at-bat and a great finish to a great Giants win. The Giants will send rookie Madison Bumgarner to the mound Wednesday for Game 4 of the NLCS. Now, some note has been made about Bumgarner’s home/road splits this season. But let’s take a closer look. Bumgarner was 6-3 with a 1.93 ERA on the road in the regular season, and that didn’t include his quality start in Game 4 of the NLDS. At home? Bumgarner was was 1-3 with a 4.63. To get that ERA, you’ve look at 23 earned runs in 45 innings pitched at AT&T Park. He’s allowed five home runs at home. But if you take away the Aug. 25 start against the Reds, his home numbers are not that bad. You may remember that start. Bumgarner gave up seven earned runs in 2 2/3 innings pitch. He gave up three of his five home runs allowed at home in that start. Remove that start, and his home ERA is 3.40. Three of his last four home starts were quality starts. The one that was not almost was a quality start — two earned runs in 5 2/3 innings. Since that disastrous start against the Reds, Bumgarner has not allowed more than two runs in any of his last seven starts, including the NLDS start against the Braves. The Giants face Joe Blanton, who beat the Giants in his only start against them this season. In that start, he gave up two runs (both on homers) in 6.1 IP and struck out seven on Aug. 18. But in September/October, he has given up eight home runs in seven appearances. He has not started since Sept. 29, when he gave up no earned runs in seven innings against the Nationals. He did pitch one inning of relief against the Braves on the last day of the season, giving up two runs on four hits.